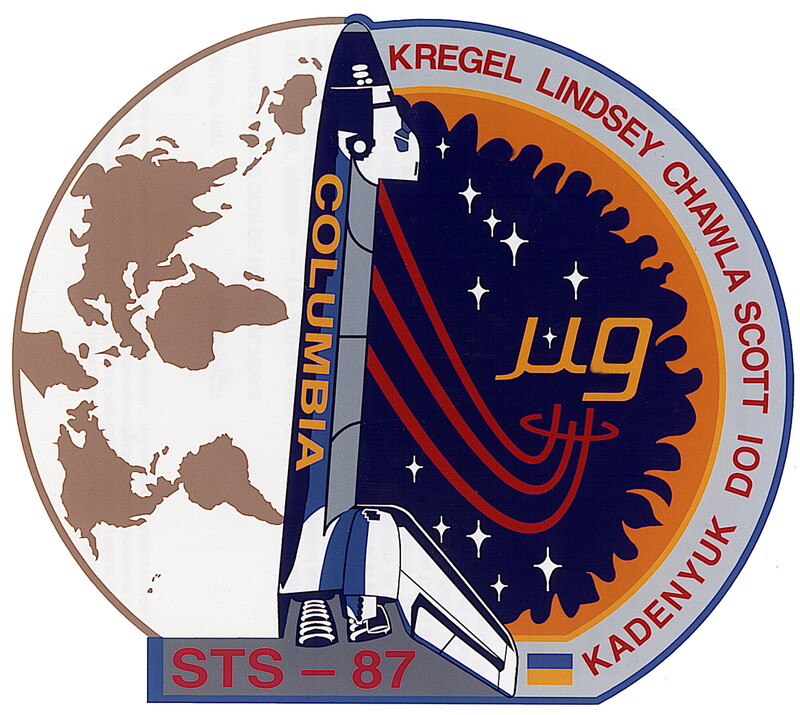 On launch day, Columbia's eight and a half minute climb to orbit took a different approach from all previous Shuttle launches. Most of the powered flight period were as before with a "heads down" roll maneuver performed shortly after liftoff and solid rocket booster separation just over two minutes into the launch. However, at about six minutes into the flight, a second roll maneuver to a "heads up" position was performed. 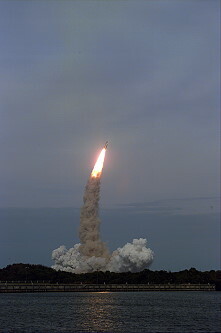 The second roll maneuver, done gradually over a 20 second period, allowed the Shuttle to acquire communications with the Tracking Data Relay Satellite System (TDRSS). Use of the TDRSS removed the need for Bermuda tracking station support and provided a cost savings to the space agency. STS-87 carried out the mission USMP-4 (United States Microgravity Payload). 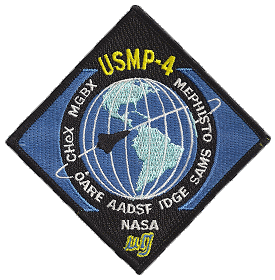 The United States Microgravity Payload (USMP-4) is a Spacelab project managed by Marshall Space Flight Center, Huntsville, Alabama. The complement of microgravity research experiments is divided between two Mission-Peculiar Experiment Support Structures (MPESS) in the payload bay. The extended mission capability offered by the Extended Duration Orbiter (EDO) kit provides an opportunity for additional science gathering time. Leonid Kadenyuk became the first astronaut from the Ukraine. In addition, STS-87 astronauts Winston Scott and Takao Doi performed a 5-hour spacewalk to evaluate equipment and procedures that will be used during construction and maintenance of the International Space Station. This spacewalk accomplished all of the primary objectives originally planned as part of the STS-80 mission in November 1996 that were not achieved due to a stuck airlock hatch. SPARTAN 201-04 was released a day late (because of a safemode event on the SOHO satellite whose results it should calibrate), at 21:05 UTC on November 21, 1997. However the satellite did not start its automatic orientation maneuver because the crew failed to send it the correct commands prior to release. 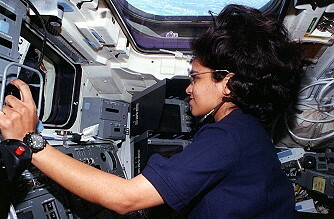 Mission specialist Kalpana Chawla moved the robot arm in to grapple it again at about 21:10 UTC. The grapple was unsuccessful and the SPARTAN was left tumbling. At 22:10 UTC it was decided to move away from SPARTAN for the day. 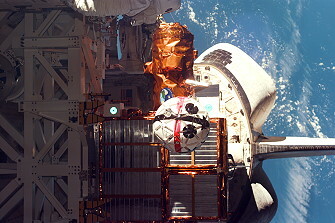 SPARTAN was recaptured by hand, during a not planned spacewalk by Takao Doi and Winston Scott on November 24, 1997 (7h 43m). After patiently waiting for over two hours as SPARTAN slowly rotated above their heads, the astronauts grabbed the SPARTAN satellite, and then lowered it onto its berth in the payload bay. 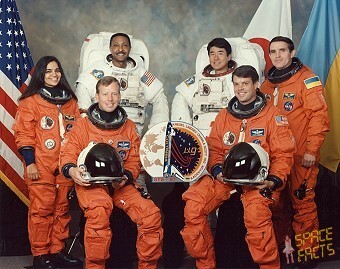 The astronauts had difficulty berthing it so Kalpana Chawla grappled it with the RMS arm and berthed it. The tests of space station tools including a new small crane went well, but the free-flying Sprint camera subsatellite was not deployed due to lack of time. NASA decided not to redeploy SPARTAN on this mission. 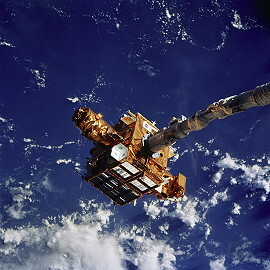 On December 02, 1997, SPARTAN was unberthed with the RMS arm and used while attached to the arm for tests of an instrument called the Video Guidance Sensor which will be used during space station dockings. SPARTAN 201-04 was a Solar Physics Spacecraft designed to perform remote sensing of the hot outer layers of the sun's atmosphere or corona. The objectives of the observations were to investigate the mechanisms causing the heating of the solar corona and the acceleration of the solar wind which originates in the corona. Two primary experiments were the Ultraviolet Coronal Spectrometer from the Smithsonian Astrophysical Observatory, and the White Light Coronograph (WLC) from the High Altitude Observatory. SPARTAN 201 had three secondary experiments. The Technology Experiment Augmenting SPARTAN (TEXAS) was a Radio Frequency (RF) communications experiment which provided flight experience for components baselined on future SPARTAN missions, and a real time communications and control link with the primary SPARTAN 201 experiments. This link was used to provide a fine pointing adjustment to the WLC based on solar images downlinked real time. The Video Guidance Sensor (VGS) Flight Experiment was a laser guidance system which tested a key component of the Automated Rendezvous and Capture (AR&C) system. The SPARTAN Auxiliary Mounting Plate (SPAM) was a small equipment mounting plate which provided a mounting location for small experiments or auxiliary equipment of the SPARTAN Flight Support Structure (SFSS). It was a honeycomb plate using an experimental Silicon Carbide Aluminum face sheet material with an aluminum core. 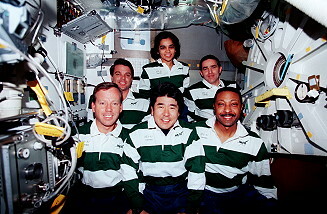 The crew performed experiments in the field of materials science and biology (i.e. flame and fluid experiments, experiments with soybeans and moss). The Advanced Automated Directional Solidification Furnace (AADSF) was a sophisticated materials science facility used for studying a common method of processing semiconductor crystals called directional solidification. Solidification is the process of freezing materials. In the type of directional solidification to be used in AADSF, the liquid sample, enclosed in quartz ampoules, will be slowly solidified along the long axis. A mechanism will move the sample through varying temperature zones in the furnace. To start processing, the furnace melts all but one end of the sample towards the other. Once crystallized, the sample remained in the furnace to be examined post-flight. The solidification front was of particular interest to scientists because the flows found in the liquid material influence the final composition and structure of the solid and its properties. The Confined Helium Experiment (CHeX) provided a test of theories of the influence of boundaries on matter by measuring the heat capacity of helium as it is confined to two dimensions. The Isothermal Dendritic Growth Experiment (IDGE) was a materials science solidification experiment that researchers will use to investigate a particular type of solidification called dendritic growth. Dendritic solidification is one of the most common forms of solidifying metals and alloys. When materials crystallize or solidify under certain condition, they freeze unstably, resulting in tiny, tree-like crystalline forms called dendrites. Scientists are particularly interested in dendrite size, shape, and how the branches of the dendrites interact with each other. These characteristics largely determine the properties of the material. Designed for research on the directional solidification of metallic alloys, the Material pour l'Etude des Phenomenes Interssant la Solidification sur Terre et en Orbite (MEPHISTO) experiment was primarily interested in measuring the temperature, velocity, and shape of the solidification front (the point where the solid and liquid contact each other during solidification.) MEPHISTO simultaneously processed three identical cylindrical samples of bismuth and tin alloy. In the first sample, the temperature fluctuations of the moving solidification were measured electrically, with disturbing the sample. The position of the solid to liquid border was determined by an electrical resistance technique in the second sample. In the third sample, the faceted solidification front was marked at selected intervals with electric current pulses. 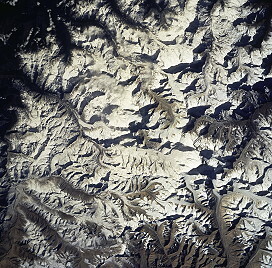 The samples were returned to Earth for analysis. During the mission, MEPHISTO data were correlated with data from the Space Acceleration Measurement System (SAMS). 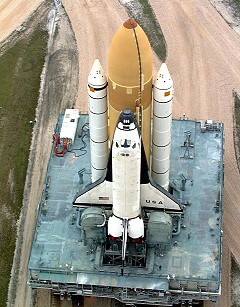 By comparing data, scientists can determine how accelerations aboard the shuttle disturb the solid to liquid interface. The Space Acceleration Measurement System (SAMS), sponsored by NASA Lewis Research Center (now NASA Glenn Research Center), was a microprocessor-driven data acquisition system designed to measure and record the microgravity acceleration environment of the USMP carrier. The SAMS had three triaxial sensor heads that are separate from the electronics package for remote positioning. In operation, the triaxial sensor head produced output signals in response to acceleration inputs. The signals were amplified, filtered, and converted into digital data. The digital acceleration data was transferred to optical disk memory for ground analysis and downlinked to the ground for near-real-time analysis. Each accelerometer had a mass suspended by a quartz element is such a manner to allow movement along one axis only. A coil was attached to the mass and the assembly was placed between two permanent magnets. An applied acceleration displaced the mass form its resting position. This movement was sensed by a detector, causing SAMS electronics to send a voltage to the coil, producing exactly the magnetic field needed to restore the mass to its original position. The applied voltage was proportional to the applied acceleration and was output to the SAMS electronics as acceleration data. 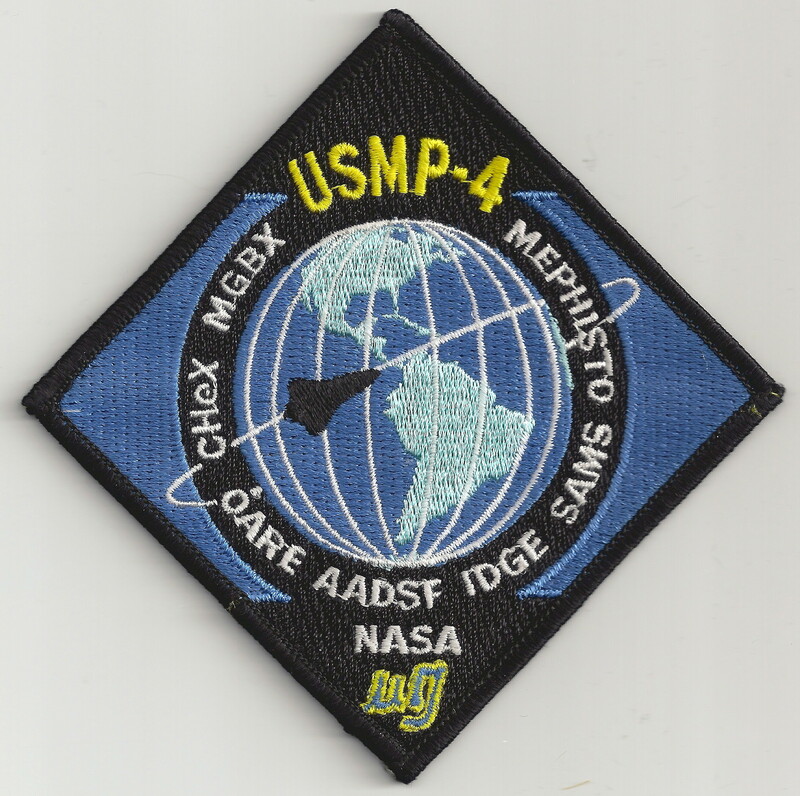 While flying separately in the cargo bay, the Orbital Acceleration Research Experiment (OARE), sponsored by NASA Lewis Research Center (now Glenn Research Center), was an integral part of USMP-04. It was a highly sensitive instrument designed to acquire and record data of low-level aerodynamic acceleration along the orbiter's principal axes in the free-molecular flow regime at orbital altitudes and in the transition regime during re-entry. 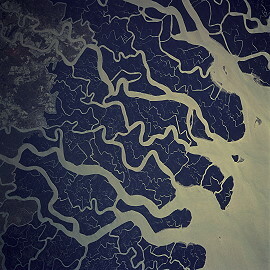 OARE data was also downlinked during the mission for near-real-time analysis in support of the USMP science experiments. OARE data supported advances in space materials processing by providing measurements of the low-level, low frequency disturbance environment affecting various microgravity experiments. OARE data also supported advances in orbital drag prediction technology by increasing the understanding of the fundamental flow phenomena in the upper atmosphere. The objective of the Shuttle Ozone Limb Sounding Experiment (SOLSE) was to determine the altitude distribution of ozone in an attempt to understand its behavior so that quantitative changes in the composition of our atmosphere can be predicted. SOLSE was intended to perform ozone distribution that a nadir instrument can achieve. This was performed using Charged Coupled Device (CCD) technology to eliminate moving parts in a simpler, low cost, ozone mapping instrument. The experiment was housed in a Hitchhiker (HH/GAS) canister with canister extension ring and equipped with a Hitchhiker Motorized Door Assembly (HMDA). Instrumentation included an Ultraviolet (UV) spectrograph with a CCD array detector, CCD array and visible light cameras, calibration lamp, optics and baffling. 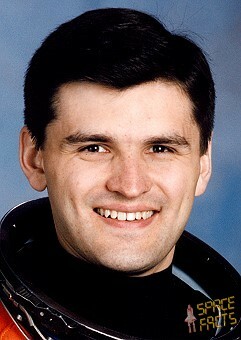 Once on orbit a crew member activated SOLSE which performed limb and Earth viewing observations. Limb observations focus on the region 20 kilometers (12 mi) to 50 kilometers (31 mi) altitude above the horizon for the Earth's surface. Earth viewing observations enabled SOLSE to correlate the data with other nadir viewing, ozone instruments. The Loop Heat Pipe (LHP) tested advance thermal energy management technology and validating technology readiness for upcoming commercial spacecraft applications. 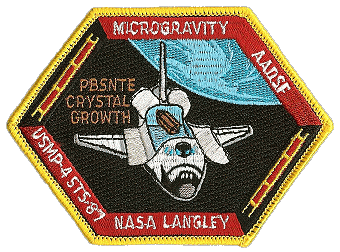 The LHP was operated with anhydrous ammonia as the working fluid to transport thermal energy with high effective conductivity in zero gravity. LHP was a passive, two-phase flow heat transfer device that was capable of transporting up to 400 watts over a distance of 5 meters through semiflexible, small-diameter tubes. It used capillary forces to circulate the two-phase working fluid. The system was self-priming and totally passive in operation. When heat was applied to the LHP evaporator, part of the working fluid vaporized. The vapor flowed through the vapor transport lines and condenses, releasing heat. The condense returned to the evaporator via capillary action through the liquid transport lines. The Sodium Sulfur Battery Experiment (NaSBE) characterized the performance of four 40 ampere-hour sodium-sulfur battery cells, representing the first test of sodium-sulfur battery technology in space. Each cell was composed of a sodium anode, sulfur cathode, and solid ceramic sodium ion conducting electrolyte and separator. The cells had to be heated to 350 degrees Celsius to liquefy the sodium and sulfur. Once the anode and cathode were liquefied, the cells started to generate electrical power. Once in orbit, a crewmember activated NaSBE and then the experiment was controlled by the GSFC Payload Operations Control Center (POCC). The Turbulent Gas Jet Diffusion Flames (TGDF) payload was a secondary payload that used the standard Get Away Special carrier. Its purpose was to gain an understanding of the fundamental characteristics of transitional and turbulent gas jet diffusion flames under microgravity conditions and to acquire data that will aid in predicting the behavior of transitional and turbulent gas jet diffusion flames under normal and microgravity environments. TGDF imposed large-scale controlled disturbances on well-defined laminar microgravity diffusion flames. They were on axisymmertic perturbations to laminar flames. The variables for the proposed tests were the frequency of the disturbance mechanism which was either 2.5 Hz, 5 Hz, or 7.5 Hz. Get Away Special (GAS G-036) payload canister contained four separate experiments that hydrated cement samples, record configuration stability of fluid samples, and exposed computer discs, compact discs, and asphalt samples to exosphere conditions in the cargo bay of the orbiter. The experiments were the Cement Mixing Experiment (CME), the Configuration Stability of Fluid Experiment (CSFE), the Computer Compact Disc Evaluation Experiment (CDEE) and the Asphalt Evaluation Experiment (AEE). The Extended Duration Orbiter (EDO) Pallet was a 15 foot (4.6 m) diameter cryo-kit wafer structure. Weighing 352 kilograms (780 lb), it provided support for tanks, associated control panels, and avionics equipment. The tanks stored 167 kilograms (370 lb) of liquid hydrogen at -250 degrees Celsius, and 1,417 kilograms (3,120 lb) of liquid oxygen at -176 degrees Celsius. Total empty mass of the system was 1,620 kilograms (3,600 lb). When filled with cryogens, system mass was approximately 3,200 kilograms (7,100 lb). Oxygen and hydrogen were supplied to the orbiter's three electrical power generating fuel cells, where they were converted into sufficient electrical energy to support the average 4 family-member house for approximately 6 months. About 1,360 kilograms (3,000 lb) of pure drinking water was also produced by the fuel cells. With the EDO pallet, the orbiter could support a flight for a maximum of 18 days. Longer on-orbit missions benefit microgravity research, Life Sciences research, Earth and celestial observations, human adaptation to the zero-G environment, and support to the Space Station. The Middeck Glove Box (MGBX) was a facility designed for materials science and biological science experiment handling. It consisted of two primary systems; an Interface Frame (IF) and a Glovebox (GB). 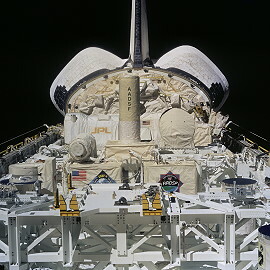 The MGBX facility (with associated electronics) provided an enclosed working area for experiment manipulation and observation on the shuttle mid-deck. 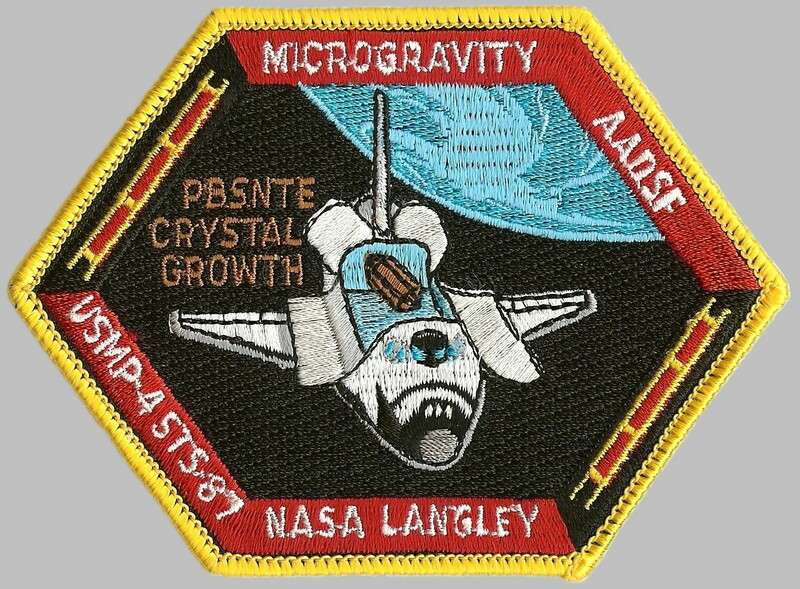 The MGBX experiments on this flight were: WCI - The objective of the Wetting Characteristics of Immiscibles was to investigate the influence of alloy/ampoule wetting characteristics on the segregation of immiscible liquids during microgravity processing. The Enclosed Laminar Flames (ELF) experiment objective was to validate the zero-gravity Burke-Schumann model and the gravity-dependent Hegde-Bahadori extension of the model, investigated the importance of the buoyancy-dependent flow field as affected by oxidizer flow on flame stabilization, examined the state relationships of co-flow diffusion flames under the influence of buoyancy conditions (gravity versus pressure), and studied the flow vortex and diffusion flame interactions. The Particle Engulfment and Pushing by Solidifying Interfaces (PEP) experiment objectives were to generate an accurate value for the critical velocity in a convection-free environment, validate present theoretical model, enhance fundamental understanding of dynamics of insoluble particles at liquid/solid interfaces, and improve understanding of physics associated with solidification of liquid metals-ceramic particles mixtures. 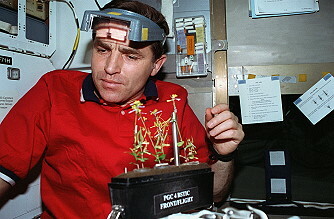 The Collaborative Ukraine Experiment (CUE) was a mid-deck payload designed to study the effects of microgravity on plant growth. The CUE was composed of a group of experiments that were flown in the Plant Growth Facility (PGF) and in the Biological Research in Canisters (BRIC). The experiments also required the use of a Gaseous Nitrogen (GN2) Freezer and the fixation hardware. Investigators in Ukraine and the United States selected the experiments as a model for scientific collaboration between the two countries. The PGF supported plant growth for up to 30 days by providing acceptable environmental conditions for normal plant growth. The PGF was composed of the following subsystems: Control and Data Management Subsystems (CDMS), Fluorescent Light Module (FLM), Atmospheric Control Module (ACM), Plant Growth Chambers (PGCs), Support Structure Assembly (SSA), and the Generic External Shell (GES). The complete PGF replaced one mid-deck locker and operated on 28 V direct current (dc) power. The plant specimen studied in the PGF was Brassica rapa (turnip). 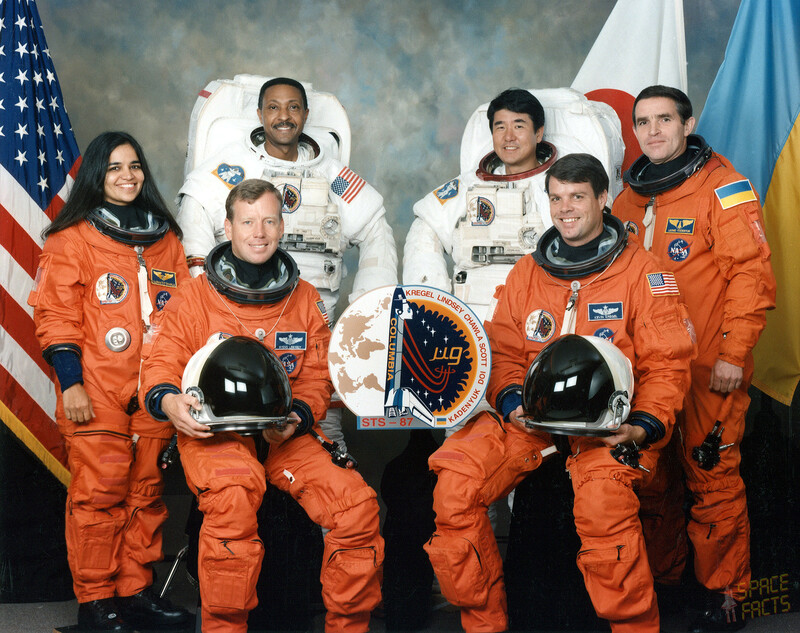 A second (planned) EVA by Winston Scott and Takao Doi was performed on December 02, 1997 (4h 59m). During this EVA the small crane again was tested. For the first time the Autonomous EVA Robotic Camera Sprint (AERCam Sprint) was tested. This camera was in a "ball" and steered with a joystick in the Flight deck and can check every part of a shuttle (and later the ISS).The spacewalk was the sixth in a continuing series of Extravehicular Activities (EVAs) called the EVA Development Flight Tests (EDFT). This flight test series of spacewalks was designed to evaluate equipment and procedures planned for the station and to build spacewalking experience in preparation for assembly of the station. The spacewalk included an end-to-end demonstration of a maintenance task simulating the changing out of an International Space Station battery. A crane designed for use in moving large Orbital Replacement Units (ORUs) on the space station was evaluated as part of the task. ORUs can be any piece of equipment that may be replaced on the station's exterior, and, for this evaluation, the simulated station battery was moved using the crane. Following the large ORU evaluation, use of the crane for moving a small ORU, a cable caddie that previously was used during an STS-72 spacewalk, was evaluated by Takao Doi. The 156-pound (70.8 kg) crane was six feet (1.8 meter) tall and had a boom that telescopes from four feet long to an extended length of 17.5 feet (5.3 meters). It was designed to aid spacewalkers in transporting ORUs with a mass as great as 600 pounds (272 kg) from translation carts on the exterior of the International Space Station to various worksites on the truss structure. The crane boom's attachment mechanism also provided a temporary stowage location for large units during maintenance work. The crane was unstowed and installed to a socket along the left middle side of Columbia's cargo bay for the evaluations. The crane's boom could extend by turning a ratchet fitting using a power tool or by using a backup manually operated hand crank. The crane also could be moved from side to side and up and down by respective manually operated hand cranks. 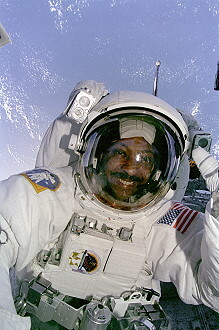 Winston Scott evaluated working with the simulated large ORU from a Portable Foot Restraint (PFR), a work platform for spacewalkers, attached to the end of Columbia's robotic arm. Among the evaluations conducted during the spacewalk was the use of several temporary ORU handling and restraint aids, some of which are attached to the Crane. The spacewalk also evaluated the carrier for the simulated ORU, a carrier that simulates a standard International Space Station ORU work site. Later in the spacewalk, Winston Scott evaluated working with the simulated large ORU from a Portable Foot Restraint (PFR), a work platform for spacewalkers. 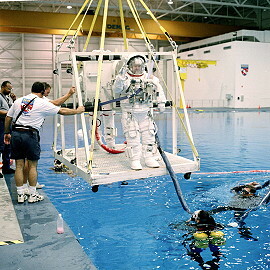 The spacewalk also evaluated a variety of other work aids and tools designed for use during station operations, including a Body Restraint Tether (BRT), a type of "third hand" stabilizing bar for spacewalkers; a Multi-Use Tether (MUT), a type of stabilizing tether similar to the BRT but that can be anchored to either round U.S. handrails or square Russian handrails; and a Power Tool designed for the station. Near the end of the spacewalk, Winston Scott released the Autonomous EVA Robotic Camera (AERCam Sprint) for a 30 minute long free-flight evaluation. AERCam Sprint was a small, remotely controlled free-flying camera to be evaluated as a prototype of future such systems on the station. At its conclusion, Winston Scott retrieved the free-flyer by his hands. The AERCam Sprint free-flyer was a 14-inch (36 centimeters) diameter, 35-pound (15.9 kg) sphere that contained two television cameras, an avionics system and 12 small nitrogen gas-powered thrusters. The sphere, which looked like an oversized soccer ball, was released by Mission Specialist Winston Scott during the spacewalk and flew freely in the forward cargo bay for about 30 minutes. 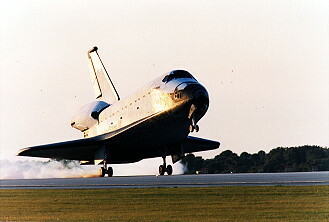 The free-flyer was remotely controlled by Pilot Steven Lindsey from the Shuttle's aft flight deck using a hand controller, two laptop computers and a window-mounted antenna.